Far be from it for Gwen to opt for a strictly traditional dress. The singer who married rocker Gavin Rossdale in 2002 wanted her wedding dress to be quite over-the-top but tasteful at the same time. John Galliano made her dreams come true in this Christian Dior number with a bright pink bottom which faded into white half way up. Only Gwen Stefani could rock ombré before it was even a thing. 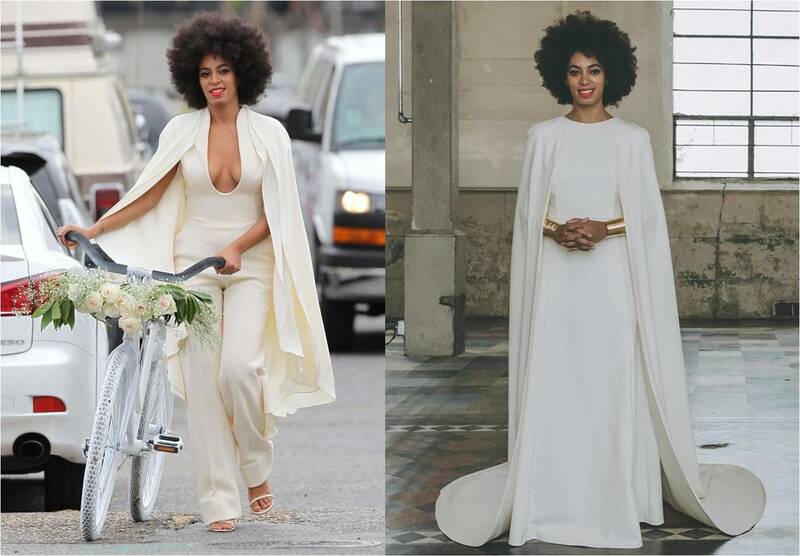 Solange Knowles needed little other than her legendary afro to be a wonderfully unconventional bride. Her nuptials with Alan Ferguson in a billowing jumpsuit featured an eclectic array of arrangements including vintage bikes and school buses instead of the regular forms of transport. Her true moment of glory, however, was when she walked down the aisle in her Athena-inspired creation by Kenzo looking every bit the Greek goddess she is. Few women are blessed with foresight in the face of all-consuming wedding madness and Olivia Palermo was one of them. Eschewing the tradition of decadent wedding gowns completely, she placed comfort on a higher pedestal than style and convention. Dressed in a modern three-piece ensemble consisting of a cashmere sweater, delicate shorts and a tulle skirt by Carolina Herrera for her big day with Johannes Huebl, Olivia looked like she was ready for her after-party before it even began. It’s not as if Keira Knightly needed to be cooler. But she went and did exactly that when she recycled a short corset Chanel ballet dress with a jacket designed by Lagerfeld for her wedding to James Righton. Doesn’t the endearing couple look like they’re in a two-member punk band? 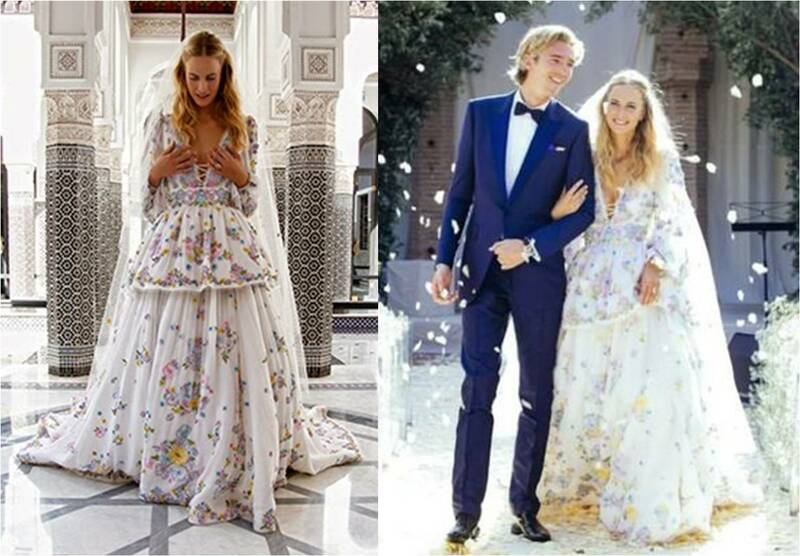 While the bride wore a custom Chanel couture gown for the initial ceremony, she opted for a more on-theme ensemble for the second one, in the form of a floral, long-sleeved frock by Peter Dundas for Emilio Pucci. We thought it was adorable, having flowers on your wedding gown when your name is Poppy. We’re sure husband James Cook is a big fan of her wry humour. Although we are really saddened by the fact that ‘Brangelina’ won’t be a legitimate nomenclature anymore, there’s no denying that Angelina Jolie’s wedding gown has exclusive bragging rights to the ‘Wedding dress of the decade’. The doting mother knew she wanted her kids to remember the day forever and found the most charming way to do it. The artwork on her Versace dress featured adorable doodles from the children, including a portrait of the whole family, animals, monsters and even the cheeky word ‘buttock’ which surely elicited some good-natured laughter as she walked down the aisle. 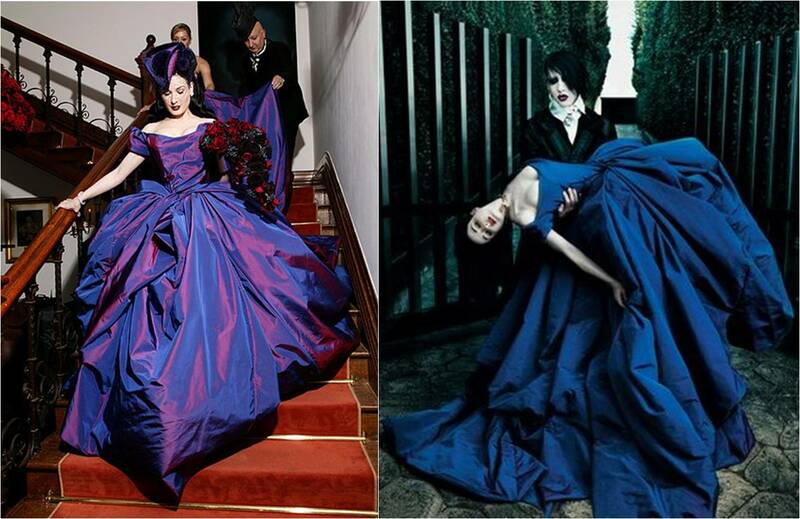 A union with Marilyn Manson warrants a legendary wedding gown. And when you are Dita Von Tesse, that dress had better be tastefully ostentatious as well – a challenge that was beautifully executed by the talented Vivienne Westwood. The Burlesque star’s goth style ceremony was complemented by this regal magenta and blue changant taffeta beauty as she played coy Victorian damsel to Manson’s terrifying goth rockstar. It’s a shame that this perfect couple had to go their separate ways. Usually, black is considered an inauspicious colour to wear on your wedding day. So is walking down the aisle to a remix of Beastie Boys and Led Zeppelin. 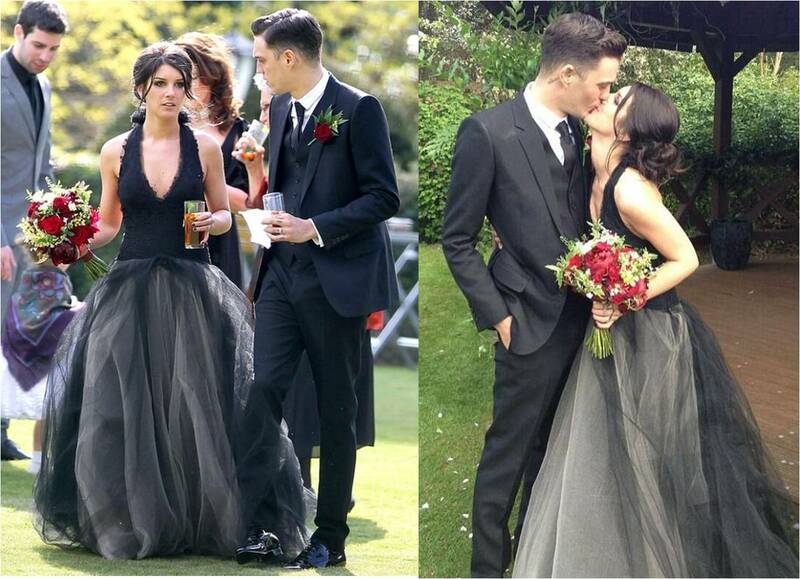 You can be forgiven though, if you look as adorable as 90210 star Shenae Grimes and model/musician Josh Beech while doing it. The Vera Wang V-neck halter dress featured a chantilly lace bodice, distressed organza and shadow lace flowers at the neck, and a multi-layered crinkle tulle skirt. 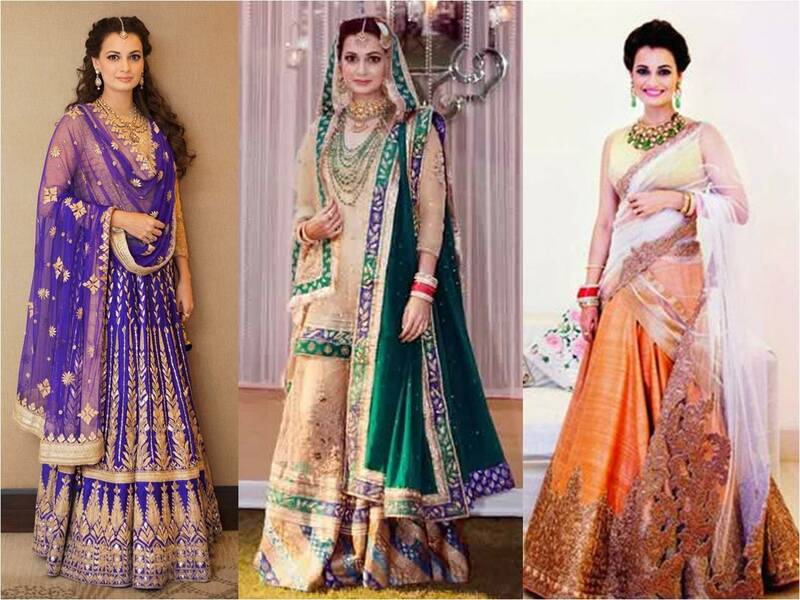 Left to right: Dia Mirza at her sangeet in an Anita Dongre lehenga, at her wedding in a Ritu Kumar sharara and at her reception in a Shantanu & Nikhil lehenga. It’s hard to go wrong with an outfit when you have a doll face like Dia Mirza’s. Being a true-blue Hyderabadi, she ditched the customary red entirely for a Ritu Kumar sharara that paid homage to her hometown. The gold and green Awadhi style ensemble was quite becoming on Dia who wanted to honour the memory of her Muslim father. The bride chose a peach and cream Shantanu and Nikhil lehenga for her reception with a contrasting diamond and emerald set. Everyone loves a good ‘Something old, something new, something borrowed, something blue’ story. Kareena’s nikaah gharara, previously worn by mother-in-law Sharmila Tagore, covered all points in case with its farshi pyjama ending in a beautiful blue border. 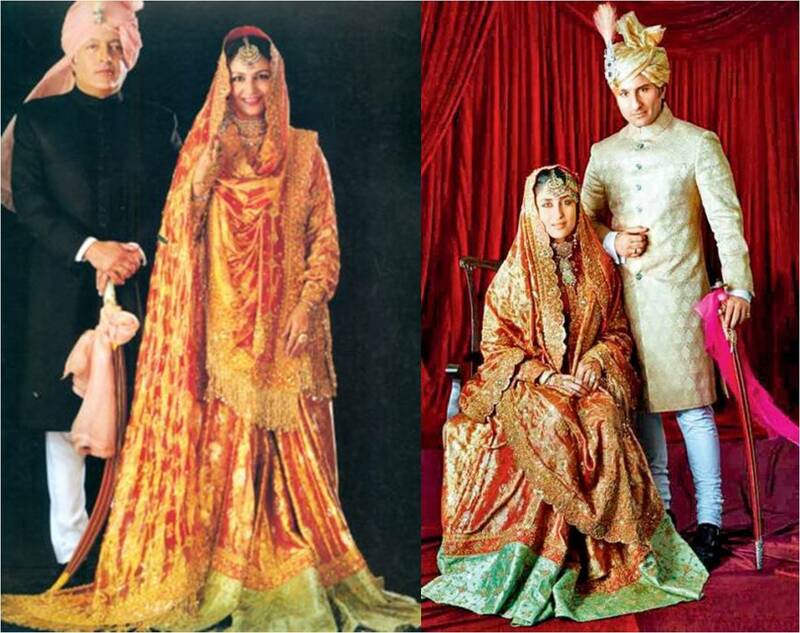 The outfit has become something of a family heirloom that was passed onto Sharmila by her mother-in-law Begum Sajida Sultan of Bhopal at her own wedding in 1939. 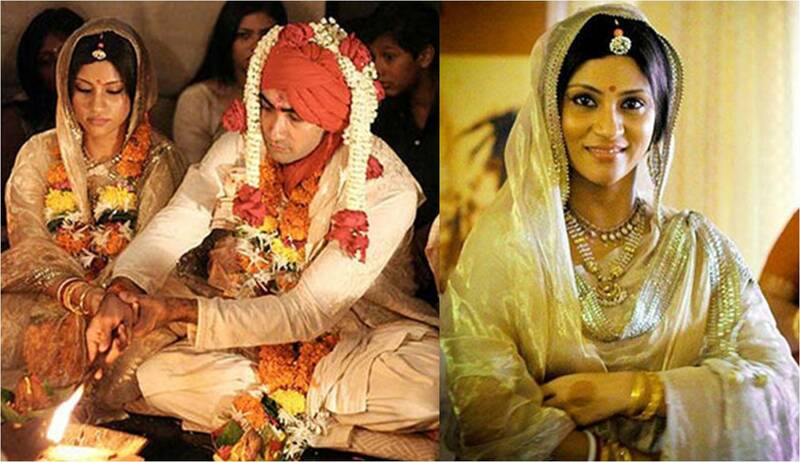 A minimalist Indian bride is a beautiful sight to behold and Konkona Sen Sharma did full justice to the simple golden bridal outfit she picked for her big day. In terms of accessories, she played the perfect doting granddaughter and chose to only wear her grandmother’s gold jewellery with a beatific smile to match. We’ve saved the best for last. 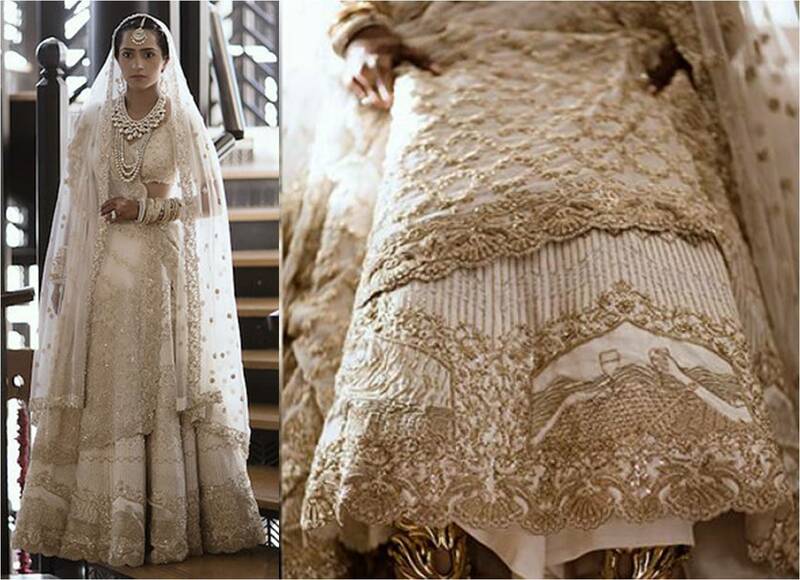 Even though the fashion designer isn’t a celebrity in the conventional sense of the word, she conquers the combined forces of Hollywood and Bollywood to clinch the top spot in the wedding dress hall of fame. A closer look at her outfit reveals elements of her love life that bring back fond memories from the time she met the groom Vanraj Zaveri right up to the moment of the proposal. Embroidered dolphins line the bottom of the lehenga throughout, sweetly alluding to the fact that the couple met while saving dolphins. Kresha might not know it yet, but she may have just defined the next big trend in wedding attire.